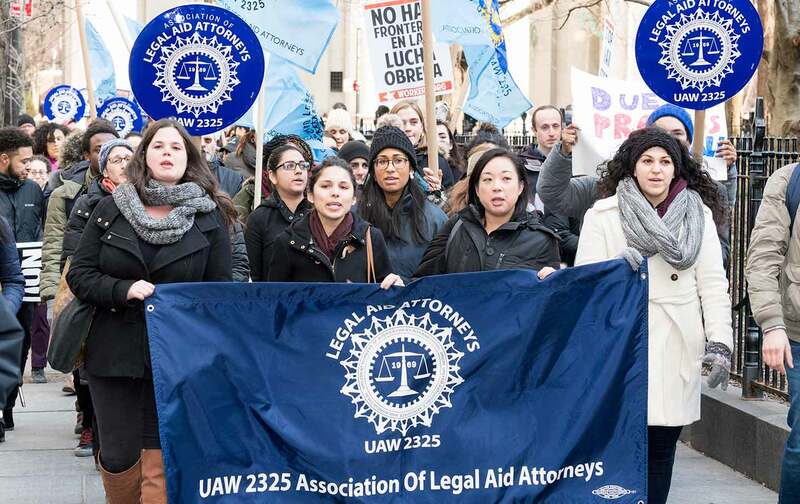 Law schools are trying to address this chronic underfunding, but there needs to be a broader rallying cry. Eminent law professors like Randall Kennedy, Carol Steiker, Todd Rakoff, and Duncan Kennedy joined a roundtable discussion last month at Harvard that Davis led to discuss the report and its implications—and the obligations demanded. The students, faculty, staff, and clinic leaders that filled the Weissman Campus Center were deluged with facts, delivered with a touch of humor (in his opening, Davis relayed a story of when he asked a powerhouse firm’s rep if he could do pro bono work to unionize Walmart employees. Came the reply: No, they’re one of our clients). Over two hours in Cambridge and over the 176 pages of his treatise, Davis challenged the nation’s law schools—most especially his own—to resist the temptation to churn out corporate lawyers (just one reason among many why public-interest lobbyists are outnumbered in Washington by corporate lobbyists 34 to one) and instead advance the public interest. He methodically picked apart excuses both tired (even Goldman Sachs has a right to a lawyer) and more reasoned (Harvard as a stepping stone to the upper class) for not doing so and, while strenuously reserving judgment about paths law graduates take, set a moonshot of 51 percent of Harvard Law grads to pursue public-interest work. To do this, HLS students may utilize the Low Income Protection Plan, where graduates working in public-interest law pay a limited portion of their income toward their loans, while LIPP covers the rest. Other schools offer a loan-assistance repayment program for those pursuing careers in public service. The conversation last month at Harvard isn’t happening in a vacuum. Students there and at other law schools—Cornell, Yale, Stanford, NYU, and Michigan among them—have established similar programs that make it easier for graduates to commit to public-interest careers without drowning in debt. But it can’t be left to the leading law schools to pick up the slack, and so Davis revisits Reginald Haber Smith’s still-radical proposal from nearly a century past: levying a tax on all legal profits to fund legal aid. A week after about 100 people filled the hall, the impetus for the round-table discussion was made clear: The new White House budget was a rehash of last year’s plan to starve the Legal Services Corporation of funding, a war waged against legal aid unabated since the Reagan era, when the right sought its abolishment (the program has remained reviled by the right wing in the decades since for “promoting liberal agendas”). Part of that agenda is apparently helping a kidney-transplant patient access her Medicare benefits. The indoctrination continues as the LSC helps survivors of domestic violence escape their abusers, and protects the elderly from predatory lenders. While the conversation last month in Cambridge concerns Harvard and the nation’s law schools, the impact of the assault on legal-services organizations is felt across all facets of American life: There’s no shortage of issues confronting legal-aid services—immigrant rights, police misconduct, discrimination, evictions, domestic violence, veterans benefits—and an increasingly unwieldy caseload as nearly nine in 10 legal-aid needs go either entirely unmet or inadequately met. That caseload burden—coupled with chronic underfunding—has led a public-defenders office in New Orleans to turn away felony cases while Fresno, California’s 60 public defenders split 42,000 cases a year between them. For one Minnesota public defender’s clients, the hallowed tradition of having your “day in court” has been cut down to just 12 minutes. The pittance paid to public-defense aid plays no small part in fueling mass incarceration, the existential threat to America’s sense of itself. About 97 percent of federal cases and 94 percent of state cases are settled through plea bargains. States aren’t stepping up. Forty-three states require that the poorest defendants must pay at least some portion of their lawyers’ fees, regardless of how little they have while legislators in Kentucky rejected a bill that would create dozens of new positions in the public defender’s office. With 2.2 million Americans behind bars—enough people to fill the city of Boston more than three times over—the burden falls hardest on people of color. Two years ago, Bernie Sanders filled stadiums railing against the 1 percent’s unpunished sins and finally marking a seismic shift in Democratic politics away from the stale centrism that people just aren’t buying. But one “1 percent” has gone largely unmentioned in the wake of the Great Recession: the 1 percent of the roughly $200 billion states spend on criminal justice that goes to legal aid. Or, of the 1.9 million lawyers working in the United States, the less than 1 percent who toil in legal aid. There’s also the fact that, despite the $96 billion in revenue made by the Top 200 law firms, just one-10th of 1 percent get donated to legal-aid funding. Demanding more funding for vital legal aid may not be a rallying cry that packs stadiums, but it’s still desperately needed action for people in need. Douglas GrantDouglas Grant is a writer and researcher living in Brooklyn. He is staff director for @ShadowingTrump.